Data centers worldwide are energy transformation devices. They draw in raw electric power on one side, spin a few electrons around, spit out a bit of useful work, and then shed more than 98 percent of the electricity as not-so-useful low-grade heat energy. They are almost the opposite of hydroelectric dams and wind turbines, which transform kinetic energy of moving fluids into clean, cheap, highly transportable electricity to be consumed tens or hundreds of miles away. But maybe data centers don’t have to be the complete opposite of generation facilities. Energy transformation is not inherently a bad thing. Cradle-to-Cradle author and thought leader William McDonough teaches companies how to think differently, so that process waste isn't just reduced, but actively reused. This same thinking can be applied to data center design so that heat-creating operations like data centers might be paired with heat-consuming operations like district energy systems, creating a closed-loop system that has no waste. It’s not a new idea for data centers. There are dozens of examples around the globe of data centers cooperating with businesses in the area to turn waste heat into great heat. Lots of people know about IBM in Switzerland reusing data center heat to warm a local swimming pool. In Finland, data centers by Yandex and Academica share heat with local residents, replacing the heat energy used by 500-1000 homes with data center energy that would have been vented to the atmosphere. There are heat-reuse data centers in Canada, England, even the US. 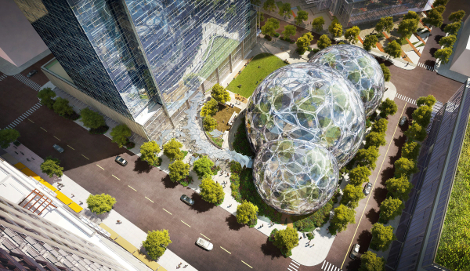 Cloud computing giant Amazon has gotten great visibility from reuse of a nearby data center’s heat at the biosphere project in downtown Seattle. There are two big issues with data center waste heat reuse: the relatively low temperatures involved and the difficulty of transporting heat. Many of the reuse applications to date have used the low-grade server exhaust heat in an application physically adjacent to the data center, such as a greenhouse or swimming pool in the building next door. This is reasonable given the relatively low temperatures of data center return air, usually between 28o and 35oC (80-95oF), and the difficulty in moving heat around. Moving heat energy frequently requires insulated ducting or plumbing instead of cheap, convenient electrical cables. Trenching and installation to run a hot water pipe from a data center to a heat user may cost as much as $600 per linear foot. Just the piping to share heat with a facility one-quarter mile away might add $750,000 or more to a data center construction project. There’s currently not much that can be done to reduce this cost. To address the low-temperature issue, some data center operators have started using heat pumps to increase the temperature of waste heat, making the thermal energy much more valuable, and marketable. Waste heat coming out of heat pumps at temperatures in the range of 55o to 70oC (130-160oF) can be transferred to a liquid medium for easier transport and can be used in district heating, commercial laundry, industrial process heat, and many more. There are even High Temperature (HT) and Very High Temperature (VHT) heat pumps capable of moving low-grade data center heat up to 140oC. 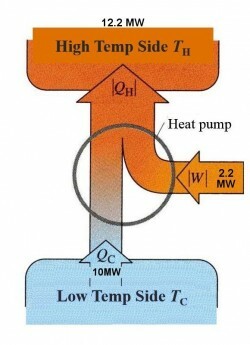 The heat pumps appropriate for this type of work are highly efficient, with Coefficient of Performance (COP) of 3.0 to 6.0, and the energy used by the heat pumps gets added to the stream of energy moving to the heat user, as shown in the diagram below. If a data center is using heat pumps with a COP of 5.0, running on electricity that costs $0.10 per kWh, the energy can be moved up to higher temperatures for as little as $0.0083 per kWh. 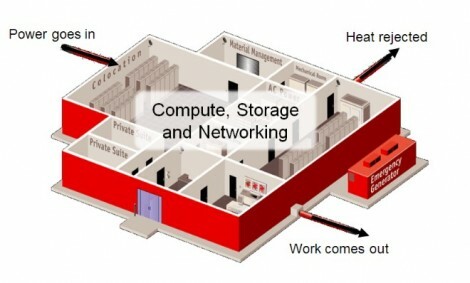 Waste heat could be a source of income for the data center. New York’s Con Edison produces steam heat at $0.07 per kWh (€0.06 per kWh), and there have been examples of heat-and-power systems selling waste heat to district heating systems for €0.1-€0.3 per kWh. For a 1.2MW data centers that sells all of its waste heat, that could translate into more than $350,000 (€300,000) per year. That may be as much as 14% of the annual gross rental income from a data center that size, with very high profit margins. There’s also the possibility of combining data centers with power plants for increased efficiency and reuse of waste heat. Not just in the CHP-data center sense described by Christian Mueller in this publication in February, or the purpose-built complex like The Data Centers LLC proposed in Delaware. Building data centers in close proximity to existing power plants could be beneficial in several ways. In the US, transmission losses of 8-10% are typical across the grid. Co-locating data centers right next to power plants would eliminate this loss and the capital expense of transporting large amounts of power. Second, power plants make “dumb” electrons, general-purpose packets of energy that need to be processed by data centers to turn into “smart” electrons that are part of someone’s Facebook update screen, a weather model graphic output, or digital music streaming across the internet. Why transport the dumb electrons all the way to the data center to be converted? Third, a co-located data center could transfer heat pump-boosted thermal energy back to the power plant for use in the feed water heater or low-pressure turbine stages, creating a neat closed-loop system. There are important carbon footprint benefits in addition to the financial perks. Using the US national average of 1.23 lb CO2 per kWh, a 1.2MW data center could save nearly 6,000 metric tons of CO2 per year by recycling the waste heat. These applications are starting to appear in small and large projects around the world. The key is to find an application that needs waste heat year round, use efficient, high-temperature heat pumps, and find a way to actively convert this wasted resource into revenue and carbon savings.